Diego Maradona made it all about him. DIEGO Maradona has been rushed to hospital after nearly collapsing following Argentina's dramatic win over Nigeria. The football legend could be seen in a shocking video clip being helped from the stands by worried pals following the World Cup clash, The Sun reports. The 57-year-old has sparked serious health fears and according to ESPN was checked over by medics before being taken away by ambulance. Maradona had seconds earlier sworn at the crowd during a manic celebration after the South Americans scored a late winner through Marcos Rojo and sneaked through to the last 16 to face France on Saturday. There are concerns over the wellbeing of the former Barcelona and Napoli star, who is regarded as one of the greatest players ever. Respected South American journalist Diego Cora tweeted: "Maradona had to be cared for by the doctors and was taken to hospital." He had provided a one-man sideshow to the match in St Petersburg from before the game to the final whistle. Maradona was already high on excitement when he danced with a Nigerian supporter in his executive box ahead of kick-off. 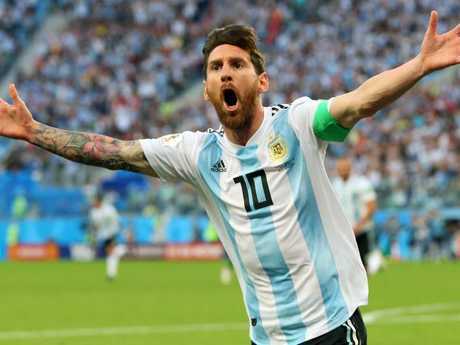 When Lionel Messi fired Argentina ahead in the first half, Maradona saluted the heavens and looked wild-eyed with delight in a strange Dracula-style celebration where he crossed his hands on his chest. He was constantly up on his feet shouting and screaming, only to be slumped back in his seat minutes later - and it looked like he had passed out just before half-time. Nigerian Victor Moses' 51st-minute penalty had Jorge Sampaoli's men headed for a humiliating group stage exit until Marcus Rojo produced a stunning finish four minutes from time to give Argentina a 2-1 lead. 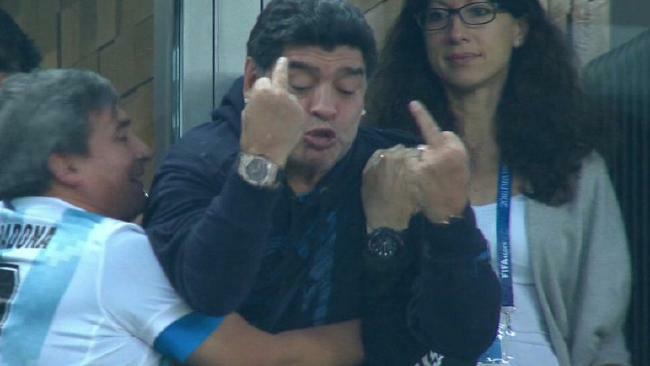 That sparked delirious scenes of celebration among the tens of thousands of Argentines in the stands and chief among them was Maradona, who reacted by raising the middle finger of both hands in just his latest controversial moment as a spectator in Russia. The colourful star had to be held back by a friend as he tried to rub his team's success in the face of some fellow spectators. The whole thing went live as the international broadcast cut to Maradona seconds after Rojo's goal. Maradona's behaviour was criticised by former England star Rio Ferdinand, who was working as a pundit for the BBC. Ferdinand said of Maradona's double middle-finger salute: "His career as a football player on the pitch was up there with the best, but unfortunately there are moments like this that do arrive. Reports from St Petersburg suggest Maradona is "stable in hospital".